As much as we would like to end up as a wireless and paperless society, it seems that the former is a whole lot easier to achieve compared to the latter. I would like to think that it is nigh impossible to become totally wireless – it simply does not make any sense at all. If there is one advantage that a regular paper notepad has over an electronic one, it would be this – there is no need for any batteries. Well, there are moments when we need to print out some documents on the spot, such as a Groupon voucher, but there is no printer in sight. Enter this $261 Rolto iPhone Screen Printer to save the day. As its name suggests, the Rolto iPhone Screen Printer will be able to put to paper what you see on the screen of your iPhone at that point in time. 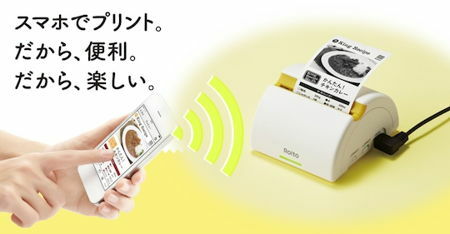 The Rolto iPhone Screen Printer will be able to print onto a long roll of paper, which is the ideal solution when it comes to making a carbon copy of a particular coupon, or for a long page. It will play nice with the free “Rolto” app from the Apple App Store, and will need to make use of special King Jim roll paper (PTSS40) which measures 50mm x 4m (1.6″ x 13.1 ft). There is no color printing supported at the moment, just old school black-and-white at 203dpi/384dots, and will be compatible with the iPhone 4, 4s, 5, 5c, 5s, and iPod touch (5G), being connected via Wi-Fi. I would like to think that this is a business-minded version of an iPhone photo printer.